I recently spent some time visiting family in the Los Angeles area. The weather was awesome. And when I say awesome, I mean I was ready to pack up my stuff and move to California immediately. The sun, the mountains, the ocean… it was more than appealing after a particularly cold and snowy winter in the Northeast. Ultimately, rationality kicked in and I’ve once again accepted that I’ll likely never live in a warm-weather climate. Disappointment aside, there are certainly benefits to living in an area with four seasons. Besides the yearly occurrence of the greatest season (Fall), the emergence of Spring brings with it an excitement that people who never have to shovel their cars out of two feet of snow will understand. From a fitness perspective, I enjoy the cyclical nature of training that comes from the different seasons. In the winter I can focus entirely on lifting big and lifting often. I’m not getting outside on a regular basis to hike, bike, walk, run, etc, so my energies are focused entirely on lifting. Once Spring hits, the volume of lifting drops slightly as I begin to incorporate outdoor activities into my daily life. Where-as I might lift on 4-5 days a week in the Winter, come Spring and Summer I will often times drop that down to 2-3 days of lifts with 2-3 days of outdoor activities. Last Summer I incorporated biking into my regular fitness regimen. I’ve never been a cyclist, and still don’t consider myself one, but do enjoy the speed and distance that can be covered on a bike as compared to on foot. My office is 5.5 miles down a wooded bike path from my home, which lends itself very well to cycling sprints. I’m kind of an on/off guy, so there isn’t any cruise control on my bike. Additionally, I have a Trek District which is a single-speed, belt-drive bike. I love the single speed because it forces me to vary my effort based on terrain. I have to really pound on the pedals to get up steep hills and then find myself without much pedaling options once I get going fast down a hill. I ride to/from work and time both rides, which allows me to keep track of progress over time. In addition to cycling, I plan on incorporating sprinting into my training this year as well. Reading Dan John’s book “Never Let Go” last Winter, there was a passage that has stuck with me and has been nagging in the back of my mind ever since. To paraphrase (and hopefully not butch it), Dan points out that if you go to a track meet you’ll never see a person with excessive body fat running a sub 50 second 400 meter. By contrast, you’d be hard-pressed to spend any amount of time on a bike path in the summer and not witness throngs of overweight people jogging and riding their bikes, clad in expensive gear, and looking like they might die. I haven’t run a 400 meter sprint for time since high school (nearly 15 years ago). I’m sure it will be a painful and shaming experience, but it’ll be great to get a sense of just how slow I’ve become. If I remember right, as a sophomore in high school I ran just over a 50 second 400 at 5’10” and around 150lbs. With basically no sprinting in the last few years, and at 6’ 195lbs, I’m guessing I’ll be lucky to hit 1:05 on my first go of it. If I can break :55 by the end of Summer I’ll be a happy man. 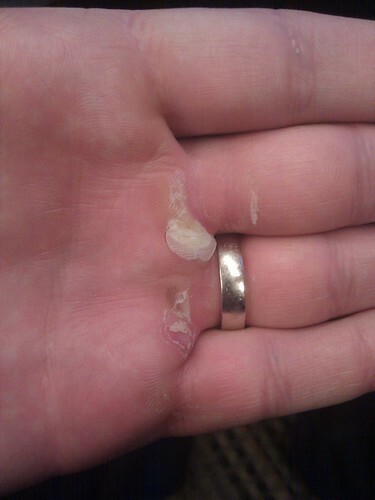 Ahh deadlifts. On the one hand, these are my favorite lift. On the other, these have also been the most difficult lift to build into my current setup. My “gym,” as mentioned earlier, is little more than a small bedroom on the third floor of a multi-family home. For this reason, I’m not able to use traditional olympic weights. I have a number of RSS feeds that keep me updated on used gym equipment available on CraigsList. If I was able to piece something together, cheaply, I would jump on the opportunity. The only problem is that it would have to be used outside. The often cold/rainy climate of Boston would prevent this from being a year-round option, as well as likely causing significant wear and tear over time. Due to these reasons, I haven’t wanted to invest in more expensive equipment until I have the space for it. I was recently referred to Rogue Fitness, a company based in Ohio that sells training equipment. Not only does their equipment look great, the prices are very competitive. As soon as I have the space (hopefully in the next year or two), I’ll definitely be spending my next $1k on some olympic equipment from these guys. All that being said, I’ve tried to find a way to incorporate deadlifts (or at least something that resembles them) into my routines. Suitcase deadlifts with the Powerblocks are an option, but I’m limited to 90lbs per hand. In the past six months I’ve turned to sandbags, as these are the only option I currently have that can be used in the 300lb range. While far from ideal, I’ve been able to establish a routine with sandbags that is both taxing and has appeared to deliver appreciable results. I have two different sandbags. Both are the same size, but one is sealed at the top with the use of rings and a clip. The second bag is a a more traditional, zippered style. I’ve found the zippered bag to be much easier to load and use. My initial fear was that the zipper would break under load, but I’ve found that the seams are much more likely to break before the zipper does. I perform lifts with over 300lbs of sand in the bag and there is no noticeable wear on the zipper. The side handles, on the other hand, ripped off around 220lbs. To perform the movement, I start at 115lbs and slowly move up by performing descending sets (10-8-8-6-4-2-etc) at increasing weight. Five sets of 10 is the goal, but I’ve recently hit that point and now, without the ability to add additional weight, will have to adjust by either increasing the amount of sets or the amount of reps.I try to balance the weight as equally as possible across the bag and then grab the sides of the bag at the middle point. The trickiest part, once the weight is evenly distributed, is to shake the bag around until the interior sandbags are condensed at either end. This will open up (in the case of the bag/weight that I use) a slight amount of free space in the center that I can use as a grip. The free space also acts as a point for the bag to bend through the movement. Gloves of some sort are definitely needed for this lift. I tried for a long time going without gloves, but the the blisters that I would get on my knuckles would take too long to heal and would prevent me from training with the sandbags for 1-2 weeks. I just use a pair of running gloves that I bought in a different life. They’re light, have some grip, and breathe pretty easily. This is definitely one of the most exhausting and hunger-driving lifts. I can hardly eat enough the day after I do these. However, I know that my current setup is not ideal and that this is the one movement that I am most limited in. I will continue to experiment, including trying to squeeze the Powerblocks into the bag (for an additional 180lbs), but a good deadlifting setup is #1 on my list of priorities for the day that I’m able to expand into a more accommodating space. One of the most important things I have learned over the years is the importance of a proper warm-up. In a lot of ways, the warm-up is more important and beneficial to long-term health than the actual work-out I perform. My warm-ups focus not just on “warming up”, but also on mobility, soft tissue work, stretching, and more. I spend most of the day sitting at a desk, working on a computer. As has been expounded on ad infinitum, this is less than idea for posture, mobility, etc. Our ancestors moved around, lifted things, walked places, ran after things, and depended on their bodies in ways we never will. My completely non-scientific guess would be that the average office worker today spends 9 hours at a desk, followed by 4 hours on the couch or in front of a computer at home, followed by 7 hours in bed. That amounts to nearly 85% of a day spent completely immobile. Combine that with atrocious eating habits and it’s no wonder obesity rates continue to grow. In an effort to counteract the realities of having a desk job, I perform roughly 30 minutes of stretching, mobility, and bodyweight exercises before every workout. In reality, these are probably things I should do every day. By the time I’ve gone through this, I’ve touched on a number of issues (hip and shoulders) and I’ll also have worked up a sweat. I’ve really enjoyed the bodyweight circuit, which I added to my warm-ups a few months ago. In those three sets I’m able to do more and move more than most people do the entire day. It also aligns with the idea that “if something is worth doing, do it every day.” I’ve really refocused my lifts to the most basic and primary movements, and while I can’t do max effort compound movements every day, I can do bodyweight variations of them as a warm-up. You make some noob gains in the first six months, get real excited, and then plateau. Or worse, you get injured, pain builds up in your shoulders, etc. Maybe this period lasts a year, maybe more. For me, it lasted for three years. Then I saw the light and started to go big, switched to 5×5, zeroed in on the stuff that really “mattered,” and promptly dislocated my shoulder. I was still doing it mostly wrong. I was still focused on the mirror muscles. By the time I got through therapy and recovery, I was clocking in at 170lbs soaking wet (at 6’ tall). However, sometimes a slap in the face, or in my case a dislocated shoulder, is what we need to refocus and figure out how to do things (mostly) right. My new focus became getting things started right before each workout. Stretching, foam rolling, mobility work, and thorough warm-ups. My lifts shifted to a lot more pulling and a lot less pushing. Through that process I grew to love pull-ups. I worked my way up to sets of 30+ pull-ups. However, my back and lats were still really lacking. It wasn’t until I put an emphasis on deadlifts and weighted pull-ups that I started to notice a difference in my back/lats. Today, I do pull-ups (supinated, neutral, and pronated grips) in two different ways. Number one, I use them in my warm-ups. To paraphrase Dan John, if something is worth doing, do it every day. Doing three sets of 10 throughout the course of my warm-ups adds up to an additional 120-150 pull-ups per week. Number two, I add weight to my pull-ups. Today, I use a 40lb vest. After my warm-up sets, I perform five sets of 10 (or as close to 10 as possible) with 90 seconds rest between sets. The first few feel easy, but the last two are a killer. As I get closer to 5X10, I’ll add more weight and start over again.